LED technology is completely different than conventional luminaires, therefore conventional photometric measuring equipment cannot be used to give accurate light levels of LED lights.LED technology is completely different than conventional luminaires, therefore conventional photometric measuring equipment cannot be used to give accurate light levels of LED lights. Ledworx invested in the latest technology (Asensektek Spectrometer) in order to ensure that the correct lighting levels are achieved. Measurements taken by a normal light meter with a photolens will not give correct readings for LED lights. The reason for this is that normal light meters do not measure the wavelength in which LED lights to have their peak output (420nm – 490nm). Normal photometers measure in the range of 490-780nm. In the below table you will see how vision is broken down into the Photopic, Mesopic and Scotopic ranges. You will note that LED lights fall within the Scotopic range and therefore you need a Spectrometer to accurately calculate the light levels of LED lights. 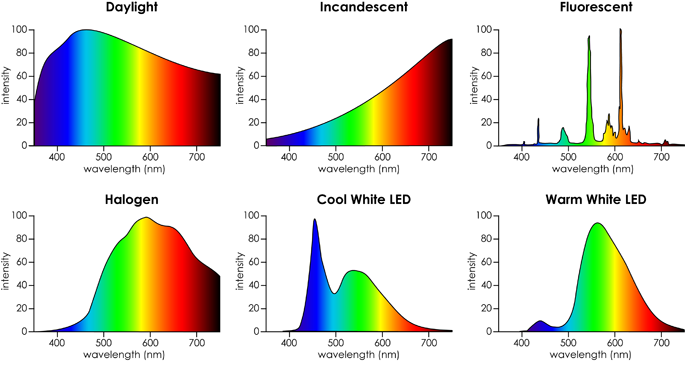 The typical Spectrum of the different light outputs can be seen in the following table. Take note of the blue range of LED lights and the importance to have the correct testing equipment. Simple photometric lux and lumen measurements will misrepresent the true brightness of white LED’s. Reason: The blue light peak of phosphor white LED’s boost Scotopic performance and in effects gives “free lumens”. Photometric measurements are performed using apparatus that is designed to spectrally match the daylight adapted response of the eye. Photopic peaks at 555nm (green). Scotopic peaks at 507nm (blue). The human eye is better tuned to blue wavelengths, for that reason the eye see the luminance of LED lights as brighter. Photometers do not measure this brightness as it is only calibrated to measure photometric ranges. CIE and IES are currently busy to find new ways to measure LED lights. At this stage they confirm that the human eye is the best measurement tool. Basically, the traditional belief that the human visual system operates in the Photopic mode is being challenged by the advent of LED’s, which have a high blue content. 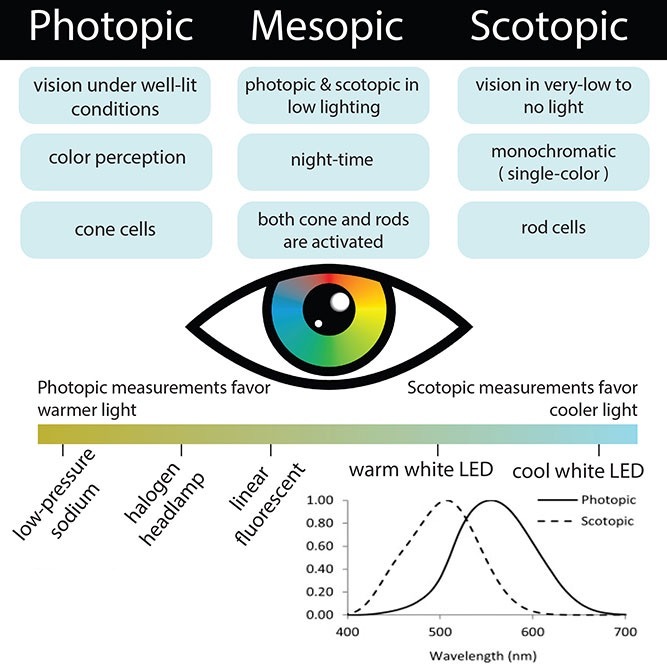 The use of Scotopic vision is already becoming accepted for low light levels, but the visual shift toward blue even under high/normal light is a current issue of debate. In essence you perceive an LED light to be brighter than measured because the recording instrument is calibrated for Photopic vision, not Scotopic. Note that this is not a feature limited to LED, a 6500K fluorescent will appear brighter than a 3000K fluorescent even if their lumen outputs are the same. The Asensetek meter is able to measure the Scotopic/Photopic ratio (S/P ratio), which provides a multiplier to factor onto the meter’s illuminance reading. You should observe a higher S/P ratio multiplier for light sources with cooler colour temperatures.